If you’re quite the green thumb, put your horticulture skills to use with an indoor garden. Grab a few pots, some quality topsoil, and start planting. Feel free to grow herbs if you’re a chef (there’s more about cooking in a minute, by the way), or if you simply prefer the aesthetic of plants, you can grow orchids, or tend to a bonsai tree. If it’s fragrance that you love most, try growing jasmine, eucalyptus, and lavender. When is the last time you took a good soak? If you’re able, draw yourself a bath, pour in some suds, and relax. Light a few candles, bring a favorite book (just don’t drop it in the tub! ), and don’t forget to put some music on before you dip your toes in! It doesn’t matter if you’re an expert baker or a mediocre cook; everyone can have fun in the kitchen. Pick up a cookbook, and find all the ingredients for an interesting recipe. You can have your groceries delivered (many grocers deliver food these days), and get to prepping. Fix your favorite meal, or bake a few dozen cookies to give to friends and family. Regardless of what you choose to cook, you’re sure to have fun, make a mess, and make something delicious! When you’re bound to the abode, or stuck in bed, grab a photo album or a yearbook off of the shelf. Take a trip down memory lane, and browse through pictures taken over the years. Or read messages that your friends had left in your high-school years. 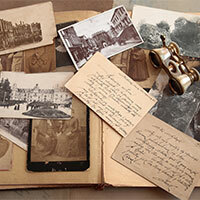 If you have a box of letters or cards, you can scour through them to recall life’s most cherished moments. Take a moment to remember your roots, and the loved ones that surround you! Quilting keeps the hands and mind busy, and it’s wholly creative. If you’re bold, you can quilt without a book of patterns. Or, if you prefer symmetry and tried-and-true designs, you can pick up a book or magazine with patterns. Then simply grab some thread, some batting (the stuff that gives a quilt volume and warmth), and some fabric. If you’d like to make a memory quilt, you can use old clothes that have been kept over the years. Or, if you prefer, make a gift quilt. The possibilities are endless! Well, that’s all for today! We hope that you make the most of your “staycation” at home. 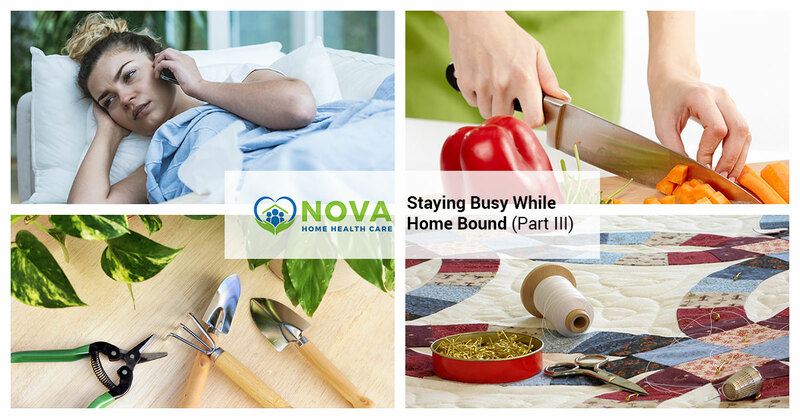 As always, count on us for home health care here in Fairfax, Alexandria, and Arlington. Feel free to learn more about our full list of in-home care services. Join us soon for more articles!